Updated Thursday August 16, 2018 by Michele Leber. 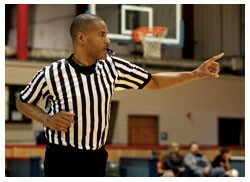 Thurman Leggs teaches an officiating class that is more than just the rules. He teaches new officials the proper mechanics, correct positioning on the court, and what your primary coverage area is (i.e., where you should be looking during the game). You'll also get some pointers on effective communication. This will help you tremendously in tough situations. But most importantly we teach you how to get plays right. That is what will separate you from the rest of the pack. After filling out the profile information, search for my class by using either my name "Thurman" or location "West Carrollton". Check out the attached file for more information, dates, cost, etc. This truly is a fantastic class to take if you are interested in becoming an OHSAA basketball official. Any questions or concerns, please contact Thurman Leggs by email or calling (513) 314-0340 or get in touch with Tony Coppock by email or calling (937) 572-7734.